Micromax has added two new smartphones - Bharat 5 Infinity Edition and Bharat 4 Diwali Edition - in its budget smartphone lineup. Ahead of the festive season, the company has launched the two handsets running Android Oreo (Go edition) out-of-the-box. While the Bharat 5 Infinity Edition is already available for sale via offline stores, the Bharat 4 Infinity Edition will be available from November 3. Android Oreo (Go edition) aka Android Go is a trimmed down version of Android Oreo aimed at low-cost smartphones. It essentially optimises the latest release of Android to run smoothly on entry-level devices, provides a rebuilt set of Google apps that use less memory, storage space, and mobile data and features the entire catalogue of Google Play highlighting apps specifically designed for entry-level users. The price in India of the Micromax Bharat 5 Infinity Edition has been set at Rs. 5,899. 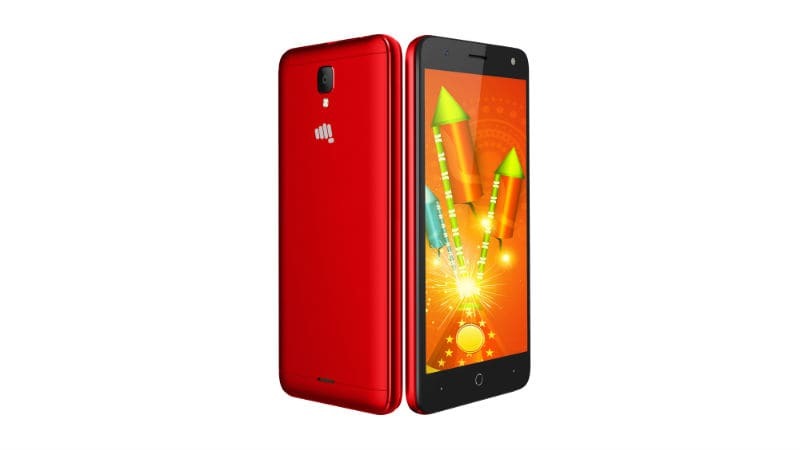 The Micromax Bharat 4 Diwali Edition, on the other hand, costs Rs. 4,249. Both the smartphones will be available for sale via brick and mortar stores. While the Bharat 5 is available in retail stores across India, the Bharat 4 will be available from November 3. As part of the launch offer, Micromax has partnered with Jio to give 25GB of additional data to users. Customer will get 5GB additional data benefits on a recharge of Rs. 198/ Rs. 299 for a maximum of 5 recharges. Notably, the offer is applicable on Micromax GO Devices and Micromax Bharat 5. The dual-SIM Micromax Bharat 5 Infinity Edition runs Android Oreo (Go edition). It sports a 18:9 Full Vision display. Micromax has not specified which processor powers the smartphone. However, it does say that the handset comes with 1GB of RAM. In terms of optics, the smartphone bears a 5-megapixel camera at the back and a 5-megapixel selfie camera. The Micromax Bharat 5 Infinity Edition comes with 16GB of inbuilt storage, expandable via microSD card (up to 64GB). It has Face Unlock as well as a fingerprint sensor. It also comes with dual VoLTE and OTG support. The company has packed a 5,000mAh battery in the smartphone. The Micromax Bharat 4 Diwali Edition also runs Android Oreo (Go edition). The smartphone sports a 5-inch display. It comes with 1GB of RAM as well. In the camera department, the handset features a 5-megapixel sensor at the back with flash and a 2-megapixel sensor at the front with flash. The smartphone is equipped with 8GB of inbuilt storage, expandable via microSD card (up to 32GB). It has a non-hybrid SIM slot but supports 4G VoLTE. The Micromax Bharat 4 Diwali Edition is fuelled by a 2,000mAh battery.